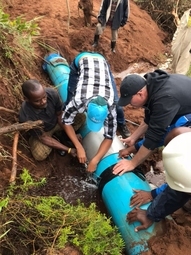 As a Young Expert I worked for Vitens Evides Intenational, where I delivered on-the-job technical assistance and training to AIAS-contracted small-town water operators in the field of the production and distribution of water. I did a management job as well, that consisted in identifying the investment needed for the water operators and supported them in the quest for funding of those investment needs, developing and submitting proposals to various funders to acquire funding for pro poor investments in water and sanitation, and support AIAS to monitor water operator performance throughout the country (Mozambique). My skills come from the experiences I have gained in different projects and also things that I liked to do as a child. During the work that I have done I realized, that I have the ability to fix technical issues, because I easily have solved technical problems, and provided with a certain proficiency training for people with low experience. As an engineer I like to work in team environment, listen to everyone's opinion and make a critical analysis and provide smart solutions to problems that we have not encountered before. I believe that I am a good leader in the projects that I have been involved in; I could plan, set priorities, delegate, make decisions and influence people with my knowledge and communication ability. I’m really interested in hydraulic engineering and water resource management in developing countries, water supply and voluntary activities related to water. Fixing problems and problems in Chibuto!